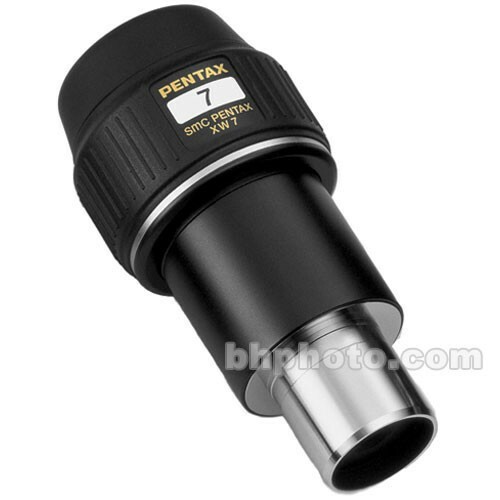 Pentax premium spotting scopes adhere to the American standard of 1.25" eyepiece thread diameter, facilitating the use of eyepieces from independent manufacturers. That also means, of course, that the wonderful Pentax eyepieces can be used in other telescopes and spotting scopes which accept 1.25" eyepieces. The XW line represents an even further improvement upon the venerable XL series. The apparent field of view has been expanded to a whopping 70°, but remarkably this was achieved without reducing their impressive eye relief of 20mm. There are eyepieces available with wider apparent viewing fields, but to take advantage of that wider field you'll have to be much closer to the eyepiece. This isn't exactly conducive to extended observing sessions. Additionally, there are lesser eyepieces with similar claims of 70° apparent viewing fields, but the performance upon the edge of these eyepieces isn't on par with the Pentaxes. If you're using a telescope with a fast aperture, this is of particular importance. These are large and expensive eyepieces, but that's the price to pay for such an enviable combination of viewing field and eye relief. Buy the best once, and you'll still be enjoying the quality long after you've forgotten the price. Should you ever need to painfully part with your purchase, the best always has the most liquidity on the used market because they're rarely ever offered.